Thank you again to Eric La Fountaine for today’s write-up and photograph! 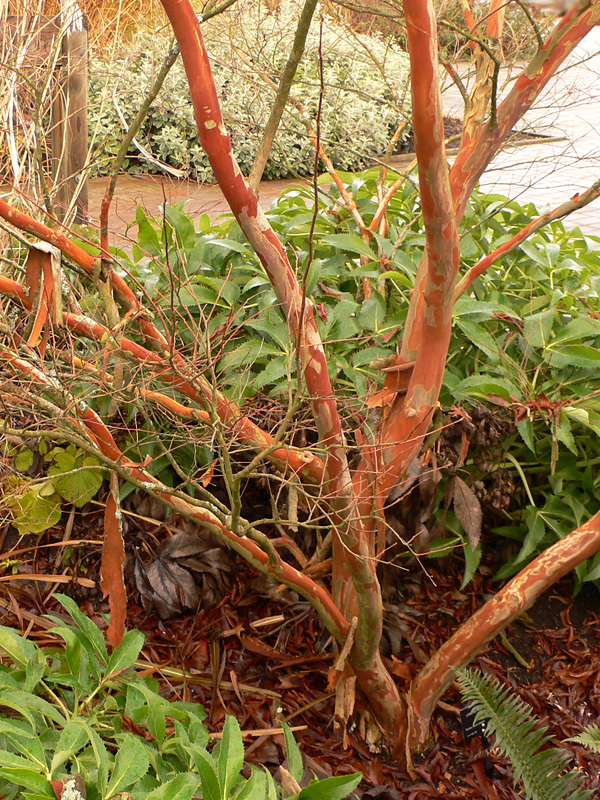 The peeling bark of the Lagerstroemia fauriei growing at the front entrance of the garden provides winter interest when few plants are blooming. Crepe myrtles are popular landscape trees in warmer areas of North America, but the commonly planted Lagerstroemia indica selections and their hybrids with Lagerstroemia fauriei are poor performers in our cool maritime climate. Fortunately, Yakushima crepe myrtle thrives in our region. While not as showy in bloom as Lagerstroemia indica, the small white flowers are borne on graceful terminal panicles and release a lovely fragrance. A rare tree in its native habitat, the island of Yakushima in southern Japan, Lagerstroemia fauriei can reach a height of 10 metres, but in our garden it is slow growing, eventually forming a slender, multistemmed, open-branched tree of 5 to 8 m tall. Lagerstroemia fauriei is featured in The Jade Garden – New and Notable Plants from Asia written by three of UBC Botanical Garden and Centre for Plant Research’s curators: Peter Wharton, Brent Hine and Douglas Justice. Yakushima Island is a true world botanical treasure. Subtropical at sea level, nearly subarctic at its summits, and seemingly everything else between, all in a small circular island south of Kyushu Japan. I’ll always fondly recall my short visit there in May 2000. Although I didn’t see anything of this Lagerstroemia, I could have walked right past it! Here in this garden it positively grabs my attention, both winter and summer, but especially winter. I recommend a “once-in-a-lifetime” visit to Yakushima. Used along with other species and hybrid to produce new hybrid crapemyrtle cultivars at United States National Arboretum. very similar peeling pattern, a bit more thin papery skin. I’m not 100% sure but I think this is the same species called L. subcostata in the Melbourne Botanic Gardens (Australia) – just about in flower now. Beautiful spreading tree like a larger version of L. indica with paler bark and less showy flowers – more attractive for its understatement. Our nurseries sell the cultivar ‘Fantasy’ (less prone to powdery mildew) but I suspect the branches are more straight and upright – does anyone know for sure?